"Here's an alternative to all those extra sugary sweet potato recipes!" In a large bowl, toss the dry onion soup mix, sweet potatoes and vegetable oil until the sweet potatoes are well coated. Arrange the mixture on a large baking sheet. Bake in the preheated oven 40 to 50 minutes, or until the sweet potatoes are tender. This came out wonderfully! I added an onion and used olive oil instead of vegetable oil... and cooked until well done.. I will be making this often! 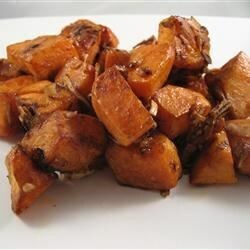 Mix sweet potatoes and white potatoes for another wonderful side dish! I've done this same recipe using red potatoes, the soup mix gives it an awesome flavor. Good recipe. I may try the boxed vegetable soup mix and oil on cut up russet potatoes now too. Endless. I liked the flavor overall, but watch the little onions; they will burn.